Last night at 10:09pm the seasons officially changed from summer to fall, although, around here it has actually felt like fall for the past few weeks. The temperatures have been dipping into the 40s at night – which would be great sleeping weather if my dog would stop stealing the extra blanket I threw on the bed! And the colors of the leaves are fading fast, creating a layer of camouflage across the back yard the color of a Golden Retriever, perfect for Murphy to hide in while sneaking up on his squirrel enemies and completing his mission of destroying every pinecone that falls in the yard. There are piles of pinecone carnage everywhere. Last weekend, Ryan and I went to our last Minnesota Stars soccer game of the season. A few weeks ago when we went, it was blazing hot and we were trying to find ways to cool off. This time, we were desperately seeking hot chocolate and even brought a blanket to sit on and save our tender summer bottoms from the chilled aluminum benches. Before each game, we gather with a large group of other dedicated soccer fans and cook out. It seemed that everyone was celebrating the end of the season because instead of the typical burger patties and hot dogs, the grill was covered in homemade Juicy Lucys (a burger with the cheese on the inside), fresh salmon filets and our contribution, wild rice brats (it was our culinary way of cheering for the home team). To accompany our fancy brats, I also made the Classic German Potato Salad I saw at the cooking demonstration at the Mill City Farmers Market this summer. But I knew I had to also make something from The Found Recipe Box as well. It needed to be a toast to the sweetness of summer, but also something that complimented the crisp fall air and also packed well for a picnic. 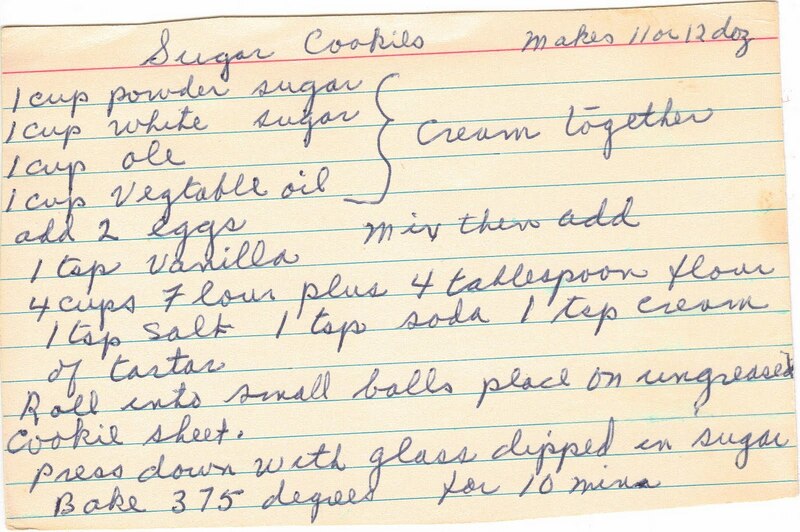 As I flipped through the cookie section, I found just the thing: Sugar Cookies. These cookies are not the kind for frosting; they are light and airy and practically crumble to bits in your mouth with each bite. They remind me of those brittle autumn leaves that Murphy and I trudge through on our daily walks that audibly deteriorate beneath our feet and release that distinct aroma of the season. 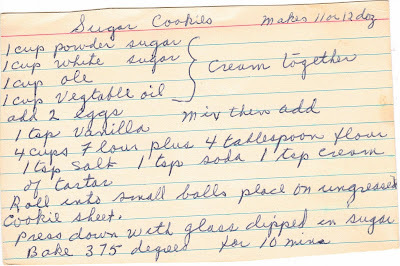 The top of the recipe card says that it makes 11 or 12 dozen. There was no way I needed that many cookies so I cut it in half, which actually yielded only about 3 dozen cookies. But there was also a mystery ingredient listed that required some research. Well, by “research” I mean scanning the card, sending it to my mom, and asking her opinion, which thankfully provided quick results (thanks mom!). It appears that the ingredient listed is “ole.” But my mom suggested it was supposed to be oleo, which is margarine. That’s what I went with and after sampling both the batter and the final product, I believe my mom was right. The final step for making the cookies is to press the batter balls down with a sugared glass before placing them in the oven. With the first batch, I forgot to do this step until two minutes before they were done cooking, at which time I promptly removed them from the oven, pressed them down and let them finish cooking. This batch ended up being a little chewier and didn’t fall apart as much as the others. Also, they kept their shape better. So if you prefer a chewier, softer sugar cookie, I suggest trying this. The cookies were a hit at the game. And to top off the night, the Stars won, giving them a chance to move on to the playoffs. Walking back to the car, wrapped up in a blanket and with my hands shoved into my pockets that were full of cookie crumbs from sneaking a few into the stadium, I couldn’t believe that fall was already here. A few weeks ago we were roasting at the Minnesota State Fair and now we were bundled up and taking bets on when the first snow storm would hit. It’s amazing how quickly time flies by, sometimes as fast as a plate of sugar cookies at a soccer game. But as I rolled the crumbs around between my fingers, I reminded myself that winter would (hopefully) go by just as fast and pretty soon we’d be gearing up for a new season of soccer and outdoor BBQs. That’s only a few months away; I’d better start thinking planning a menu!